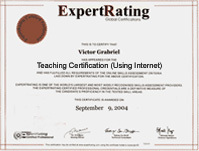 (leading to ExpertRating Teaching Certification-Using Internet). Harness the power of the Internet to make your textbooks and lessons come alive! 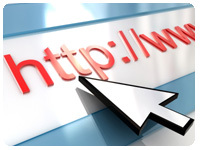 Teach your students how to locate and evaluate Internet resources. Improve the caliber and amount of discussion through the use of e-mail and discussion boards. Learn how to safeguard your students and their personal information while they are using the Internet. The Internet can make teaching easier--this course will show you how. About the ExpertRating Online Teaching Course (Using Internet) instructor : Robin Sellers holds a current teaching license. She has a Master of Arts degree in English with a concentration in technical and professional communication and a Bachelor of Arts degree in English with a certification in secondary education. Since 1995, she has taught at the secondary and post-secondary level. She encourages creativity in her classroom, teaches traditional curriculum classes in a computer lab, and incorporates technology including the Internet in her lessons. She also develops and teaches online curriculum courses. In 2003, she began teaching continuing education courses for teachers. Using the Internet in the Classroom Course requirements: For taking this instructor led ExpertRating Online Teaching Course (Using Internet) you need Internet access, e-mail, and the Microsoft Internet Explorer or Mozilla Firefox Web browser. "After taking this course, I am excited, rather than apprehensive, about using the internet in the classroom. The discussion and assignments are entirely clear and practical." "Excellent class, especially for teachers with limited technology skills who need to gain the knowledge to become more confident in using technology in their classes." "Excellent course!!!! It really gave me some ideas to implement in my classroom." "Great class! Useful information for the upcoming school year, thanks!" "Great Course! Thanks for all of the information and especially the resources!!!!" "I am so excited about the information I have gained through taking this course. At present I work with home schooling--our children are now using many of the activities. After thirty years teaching in public school, taking many courses and having many instructors, I think this course and instructor rate a score of excellent. Thank you for this wonderful experience." "I appreciated the logical progression of this course; it gave me the basic knowledge I needed. The instruction was clear, relevant, and lively--very interesting to read! I truly appreciated this course, and I thank Prof. Sellers for giving me many ideas on how to use the Internet this year with my 6th graders." "I appreciate Ms. Sellers taking time out to answer my inquiries. It is obvious that she cares about her students and their well-being." "I enjoyed the course. The instructor had many practical and useful tips for use in the classroom. The instructor gave excellent directions on getting to and setting up useful tools for the classroom." "I enjoyed this course. I will be able to use knowledge gained in the classroom. I got exactly what I wanted from this course." "I found much of the information to be very helpful. I especially value the information on Web Quests because I am trying to help a teacher create one for her American literature class. I will definitely pass along much of the information I have learned in this class." "I have worked before in a school where every faculty member and student had laptops. I thought I had learned a good deal about using the Internet in the classroom. This course has surprised me with even more uses and time saving techniques that will be very beneficial to my teaching career." ExpertRating is one of the world's only ISO 9001:2015 Certified companies (from TUV America) offering an Online Teaching (Using Internet) Course (leading to ExpertRating Teaching (Using Internet) Skills Certification). When you choose the ExpertRating Online Teaching Course (Using Internet) you can be sure that you are buying a premium International certification that is recognized by hundreds of employers and Government bodies in the US and other countries. With ExpertRating you get certified quickly online and you are equipped with a store house of information through the in-depth ExpertRating Online Teaching Course (Using Internet) Courseware which has been developed by experienced Teaching and Computer Education Experts. You can buy this ExpertRating Online Teaching Course (Using Internet) leading to Teaching certification at a special offer price of only $129.99 which includes the in-depth ExpertRating Online Teaching Course (Using Internet) Courseware and exam fee. This is the best value for money Teaching Program available till date. You get the following services within the USD $129.99 fee. In-depth ExpertRating Online Teaching Course (Using Internet) Courseware including scenarios and case studies. The process of getting yourself certified is very simple. All you have to do is buy the ExpertRating Online Teaching Course (Using Internet) for $129.99. Log in to the instructor led course using your password. Go through the ExpertRating Online Teaching Course (Using Internet) Courseware (which would take you 6 weeks) and complete the final Teaching Certification exam at your convenience. You can complete the exam within 2 months of buying the Teaching Certification. The result of the exam appears as soon as it is completed, and your Teaching Certificate is mailed immediately. The final exam is fully based upon the ExpertRating Online Teaching Course (Using Internet) Courseware that is provided along with the Teaching Certification. If you have gone through the courseware properly you should not have a problem clearing the exam. The exam consists of multiple choice questions from all chapters of the ExpertRating Online Teaching Course (Using Internet) Courseware. Using the Internet in the Classroom can promote interactive learning among the students and make learning a fun activity. 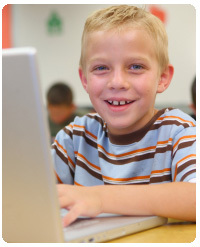 The right blend of the use of internet in the classroom and interactive learning are two of the most important techniques to improve the learning potential of the students. There are many benefits of the internet which include students’ interaction with other students across the globe, use of internet as a powerful search tool for projects, knowledge and information or to solve mathematical problems or learn languages. The exchange of information, data, and images are other benefits of using internet in the classroom. This valuable course will help the teachers to deliver an array of learning opportunities to students in many disciplines. The ExpertRating Using the Internet in the Classroom Certification course will comprehensively discuss the various benefits of the internet in the classroom. In this first lesson, you'll see firsthand the importance of the Internet to education. In this lesson you'll experience some fun Internet activities that you can use in your classroom. This lesson will also research possible funding methods such as grants for creating an Internet learning lab. This lesson is an introduction to Internet basics. This lesson will look at its history, how it works, and the top 10 terms you should know when teaching about it. Then this lesson will work with directories and search engines. Finally, this lesson will explore some techniques you can use for introducing your students to the Internet. Can your textbooks talk? They can now! This lesson will examine using online textbooks and online textbook companions. These are great for students of all ages. You'll also visit online libraries and explore the world of free books and resources online. Your classroom bookshelf will grow into a resource library overnight! Do you need help with a lesson plan? Do you need fresh ideas for your classroom? In this lesson you'll discover how to use the Internet to supplement your lesson plans and instructional handouts. This lesson will examine methods for creating traditional lesson plans and handouts with an Internet twist. Then you'll take an Internet field trip. You'll learn how to create cyberhunts (online scavenger hunts) and WebQuests. So hang on to your hats—this lesson is fun and full of great ideas! Unfortunately, the Internet isn't all fun and games. So this lesson will focus on a more serious aspect of using the Internet in the classroom. It will discuss keeping your students and your children safe while they're online. You'll learn how to increase the security of a computer and of your family's personal information. By the end of this lesson, you'll have a handy Internet-use permission form to send home with your students if you choose to do so. The Internet is a great tool for students to use when they're doing research for a report. But what about students who are too young to understand that they can't turn in reports they just copied from the Internet? What should you do when you spot passages students lifted? This lesson will discuss the ways students use the Internet to cheat and why they do it. You'll learn how to recognize Internet plagiarism and how to prevent it. Everyone who uses the Internet needs to be able to evaluate the usefulness and truthfulness of Web sites. In this lesson, you'll find out how to teach younger and older students to do this. You'll get a handout and lots of teaching tips and suggestions. This lesson will discuss using e-mail in the classroom. E-mail can help teachers do what some of them have always wished for: Add more hours to their class day so that they can cover all the required material. This lesson will also talk about e-mail etiquette, which is the proper way to use e-mail. Finally, you'll learn how to use e-mail to become better teachers. This lesson will continue it’s exploration of using e-mail as a teaching tool. This lesson will consider when it should be used for extending classroom discussions and how to manage the large volume of e-mail messages you may receive from your students. Then this lesson will discuss how to prepare your students to use e-mail and what you should expect from the messages they write. Finally, this lesson will talk about activities involving e-mail that you can use in your classroom. After this lesson, your classroom discussions will be better than ever before! This lesson will focus on other tools of communication that the online world offers. Two of them are mailing lists and newsgroups. This lesson will talk about what they are and how to use them. You'll learn how to provide younger and older students with up-to-date resources. In this lesson, you'll find about one more online communication tool for your classroom—free discussion boards. In this lesson you'll learn how to create, use, and manage one. This final lesson is devoted to bringing you some time-saving techniques. You'll discover how to use online quizzes, manage grading online, and create certificates for your students and yourself. You'll also find out where to download free educational material.